Not sure how to get rid of German roaches without an exterminator? So here is the guide you’re looking for. The German cockroach is one of the common types of roaches found in homes, hotels, and restaurants. Because these creatures can easily spread germs and bacteria that may cause diseases to humans, it is important to know the solutions on how to get rid of German roaches for good. Cockroaches or eggs usually find their way to houses through boxes, luggage, packages, and other belongings. All it takes is one egg, and you will have an infestation six months later. If your place is infested, you are more likely to see them scampering away when you open a cupboard or turn on a light. You can get rid of cockroaches naturally by using sticky traps and bait stations. Diatomaceous earth and boric acid are also effective methods to kill roaches. For severe infestations, a combination of methods may be necessary to eliminate these pests successfully. If your home or restaurant has an infestation, we are going to show you the best ways to get rid of German cockroaches without an exterminator. Because cockroaches can survive without water and food for at least a week and they multiply quickly, these creatures can pose a challenge. With patience and perseverance, you will be able to enjoy a roach-free place again. Diatomaceous earth is highly effective when it comes to killing insects, such as ants, bed bugs, fleas, and cockroaches. It is sharp enough to cut into the exoskeletons of roaches and kills these creatures right away. Sprinkle enough amount of diatomaceous earth inside or outside the house. Add some near the crevices, top of cupboards, and below the sink. This method of killing roaches will also get rid of other insects that may be present in your home. Just make sure that you wear mask and gloves when reapplying the powder. Sprinkle only in dry areas as it needs to remain dry to penetrate into exoskeletons of roaches efficiently. Another efficient way to exterminate roaches from your home is to place bait composed of sugar and boric acid. Like diatomaceous earth, boric acid also cuts the exoskeleton of cockroaches and its pesticide properties eventually kill them. It is also effective against termites and ants infestations. Here’s how to get rid of German roaches with boric acid and sugar bait. Combine 1 part of sugar, two parts flour, and 1 part boric acid in a small container. Sprinkle the mixture where the cockroaches are feeding or inhabiting. Reapply the poison every four to five days until the tiny creatures are gone. Bear in mind that boric acid is toxic, so keep it away from children and pets. Cutting off their sources of living is one of the best methods to get rid of cockroaches naturally. Depending on the temperature and their size, roaches can survive several weeks without food and can only survive up to 7 days without drinking water. Check if there are any leaks and fix them immediately to eliminate water source of these creatures. Dry all showers, bathtubs, and sinks before going to bed. Do not leave leftovers or used plates on the sink. Clean the counter and kitchen cabinets. Hide all foods and cover your fruits to prevent cockroaches from eating. Consider buying food in small amounts to prevent invasion. Take the trash out daily. Cutting off their food sources will make them more interested of baits. Soapy water is also an effective way to kill cockroaches you see crawling on the wall and floor. This also allows you to clean the surfaces to prevent germs and harmful microorganisms from spreading. To use this technique, you will need a spray bottle, liquid soap, and water. Fill a spray bottle with one-part liquid soap and 2-parts water. Shake it well. Spray into crevices and cracks where the insects hide. Keep this spray close by in case you need to kill a roach scampering across the floor. Make sure that the liquid hits the lower mid region of the insect. Wipe the surface clean. Repeat this process whenever necessary. You can also add 20 drops of peppermint essential oil in the spray for additional effects. Cockroaches like the scent of wet coffee grounds, making it an effective bait to kill these little critters. Follow these easy steps to get rid of German cockroaches using coffee grounds. Take two to three large jars and fill only half of it with water. Add coffee grounds in two or three small cups and a bit of water to make them wet. Place a cup of coffee grounds in each jar. Put the jars near the crevices, cracks, and infested areas. The aroma of wet coffee grounds will lure the roaches, making them enter the jar from which they cannot escape. Check the jars daily and throw immediately once you see roaches in it. Repeat this process until all insects are gone. This herb acts as a natural repellent to cockroaches. The nepetalactone present in catnip offers repellency properties. It is a great alternative to chemicals as it is non-toxic to humans and pets, but may have an adverse reaction to cats. In a small pot, add 1 teaspoon of fresh catnip leaves and two cups of water. Bring this to boil and remove from heat. Let it steep for 15 minutes. Strain and pour this solution into a spray bottle. Spray it over the areas where the roaches are hiding and feeding. Keep on spraying until you see dead cockroaches. Dispose of them immediately. Another option is to place catnip leaves in areas of cockroach infestation. Put new leaves after every two or three days to get rid of German cockroaches. Neem powder or neem oil is a safer alternative to biological and synthetic solutions for repelling insects. This herb contains highly volatile components that efficiently keep pests away. It is also cheaper than chemical repellents and less toxic to humans and pets. Here’s how to get rid of German cockroaches with neem oil. Add 1 tablespoon of neem oil in a medium-sized spray bottle. Spray the solution near the cracks, crevices, and other affected areas. Repeat the application as necessary. Alternatively, you can also sprinkle Neem powder around your house to keep all insects at bay. One of the effective methods to get rid of German cockroaches is by placing sticky traps near their hiding place. This technique traps the nasty creatures when they crawl on it. Place a few high-quality bundling tape sticky side on countertops, baseboards and behind cupboards. This method will also trap mice, lizards, flies and other insects that may be present in your home. The sheets will trap these creatures. Once you’ve captured enough, dispose of the sheets immediately. Repeat this method every day until you have caught all roaches. The smell of bleach and pine-sol is too strong for cockroaches. These creatures cannot stand the scent and will leave your place immediately. Follow these steps to keep German roaches away. Mix 2 cups of bleach and 2 cups of pine-sol. Add boiled water and stir well. Pour the solution in the affected areas. Open all windows and doors as the mixture produces a strong smell. Wait for at least 20 minutes and clean the areas. Follow this method whenever necessary. Aside from the methods listed above, consider following these tips to prevent roaches from lingering around your home. Place moth balls in kitchen cabinet, book shelves, and wardrobe to keep cockroaches from getting inside. Always clean and sanitize the kitchen counter, tables, and sink. Maintain all areas of the house clean and dry. Do not keep stacks of cardboard boxes, paper bags, rags or sacks in open areas. Get rid of all unwanted junk and de-clutter all storage spaces. Always use trash cans with lid and empty them every day. Seal any external cracks where cockroaches can enter your home. Fix all leaking pipes, tanks, and taps and clean the drains often. Cockroaches carry different germs and bacteria that are harmful to your health. In addition to contaminating items and surfaces they touch with waste products, they can also destroy wires, clothes, books, electronics and other household items. As these tiny creatures reproduce quickly, it is important to know how to get rid of German cockroaches as fast as possible. You can control the infestation with one or combination of the methods mentioned above. They may require repeated application to make sure that you eliminate all these pests. In case they are present in large number, you may also consider hiring an exterminator. 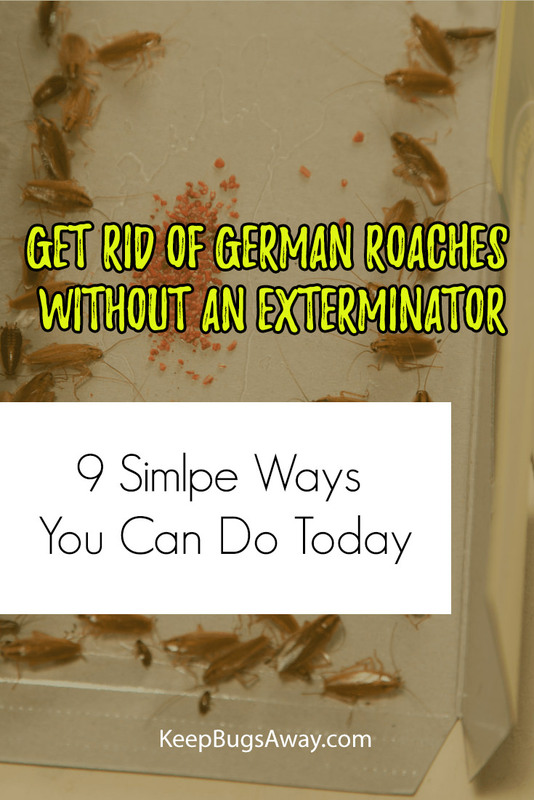 Enjoyed 9 Simple Ways to Get Rid of German Roaches Without an Exterminator? Share it with your friends so they too can learn how to get rid of German roaches.